One of the most famous and most visited sites of Haridwar, Har ki Pauri is considered as one of its five main holy sites. It is believed to be the sacred place where Lord Shiva and Lord Vishnu, two great Hindu Gods, appeared in the Vedic era. This place is considered equivalent to the Dashashwamedh Ghat in Banaras, in religious terms. It is also said that Brahma, the Hindu God of Creation, performed a yagna at the Har ki Pauri. The ghat is also said to have the holy footprints of Lord Vishnu. Har ki pauri is believed to be the exit point of the river Ganges from the mountains and its entry into the plains. A dip in the holy water of the ghat is said to relieve a person of all his sins. The place is surrounded by some ancient and some newly build temples. Throughout the year, religious rituals like 'upanayan' or the initiation ritual, 'mundan' or the head tonsuring ritual, 'asthi visarjan' or immersion of the ashes of the dead and 'shraddha' or prayers appeasing one's ancestors take place here. 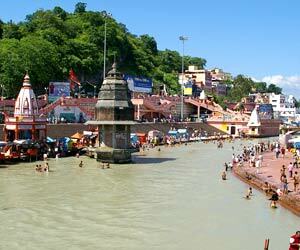 Har ki pauri is always crowded with devotees and priests, offering prayers to the Sun God and the holy Ganges. This place is the perfect destination for people deeply in love with religion, philosophy and spiritualism. The auspicious fair of Hindus, the Kumbh mela, is held at Har ki Pauri, after every 3 years. This sacred ghat was built on the bank of Ganges, by King Vikramaditya, in the memory of his brother Bhartrihari. Har ki pauri is famous for Ganga Aarti, a holy ritual of offering prayers to the Ganges. Ganga Aarti takes place on the ghat in the evening, after sunset. A group of Brahmans hold huge fire bowls in their hands and offer their holy mantras to river Ganges, Shiva - the Hindu God of destruction, Surya - the Sun God and the entire Universe. The devotees then offer flowers and earthen lamps - diyas - to river Ganges, in order to pay due regards to their ancestors in heaven. The scenario at Har ki pauri at the time of Ganga-Aarti is mesmerizing. Har Ki Pauri is the place where the divine nectar fell from celestial Kumbh. The Kumbh mela is held here (last held in 1998, next in 2010). The holy river Ganga, enters Brahmakund from one side and exits from the other. Though the water here is around waist-high, one has to be very cautious while bathing on the Ghats since the flow is swift and speedy. Chains and rails have been provided to enable devotees to catch on safely while they take a holy dip. Famous temples - Ganga Mandir and Haricharan mandir are also located here.